No new revelations to report in the world of chickens this week. 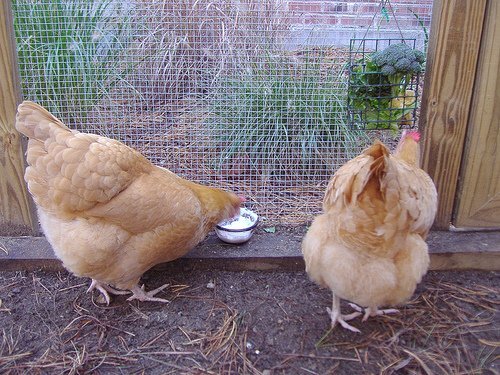 Instead I thought I’d share about the special treats (aka: table scraps) you can feed chickens. I’ve talked about it here and there during this series, but I thought actually doing a post on the do’s and don’ts of chicken treats would be good. I did a lot of research beforehand on what types of table scraps are okay to feed chickens before I started giving them anything other than their feed. I found a lot of good information on a website called BackYard Chickens. The general rule of thumb is that you don’t want to give them too much of anything. It’s still important for them to mainly be eating their feed, which is specially formulated with the nutrients they need. Just like giving your dog a treat or eating dessert. So what do my chickens love? Mainly fruit. They love strawberries, cantaloupe, honeydew, blueberries, and pineapple. I buy whole cantaloupe and honeydew once every two weeks, and I give the chickens the extra flesh and seeds that I scoop out. I also give them the tops of strawberries and as the fruit starts to get soft I will give them scraps if we aren’t going to finish all of it. You can feed chickens vegetables, too, but mine aren’t too keen on those. The only veggie I’ve tried is sugar snap peas and all they did was spread them around everywhere. I have also given them Rye bread that was going stale, and they really seemed to like it. It was a great use for stale bread, but it’s also important to make sure you feed starches in moderation. 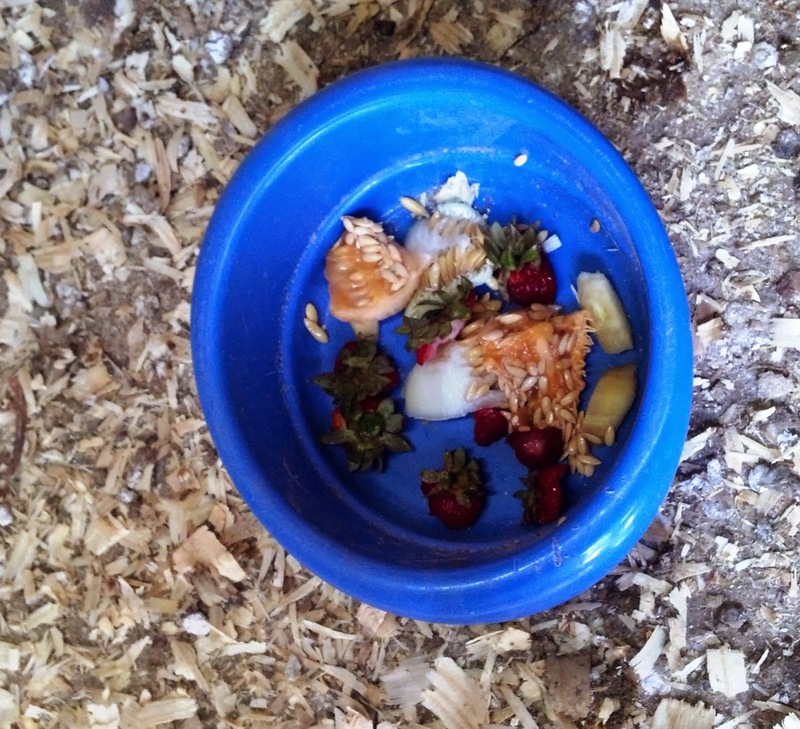 So far it looks like the chickens’ favorite food is strawberries. They go nuts when I put strawberries in the bowl for them. You can give them all sorts of other table scraps as well. They supposedly love cabbage and lettuce, so I will have to give that a try (I usually do not share my lettuce :). You can also give them cooked pasta. It would be funny to watch them eat spaghetti. Come Halloween time they will definitely be getting the innards from my Jack-o-lanterns. I have also read that you can feed them yogurt, which is good for their intestinal health. It’s best to feed them plain yogurt. They can also be fed scratch grains as a treat, which is just tossed out onto the ground in their chicken run area. They love to literally scratch at it and peck at it. Usually it consists of cracked corn and/or mixed grains. This is something you should wait to feed your chickens until they are adults, though. Always read the label and follow the manufacturer’s instructions. There are some food items which you should not feed your chickens, however. First of all, I have read that it’s not really a good idea to feed them eggs. Some websites say it’s okay to feed them cooked eggs, but others warn that eggs of any kind may lead them to start eating their own eggs. Also on the no-no list are raw green potato peels, anything really salty, dry beans, avocado skin and pit, and anything sugary such as candy. Most of these foods are not good for the chickens because their bodies are too small to process them (such as salty or sugary foods). Other foods, including the potato skins and avocado, actually contain toxins that will kill the chickens. The dried beans also have a toxin in them, but additionally they pose a choking threat for the chickens. 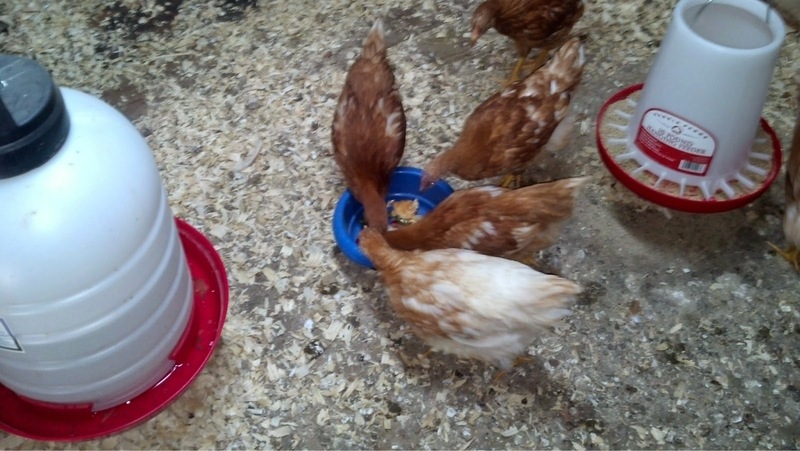 You can find a full list of all of the foods that are good and bad for chickens, as well as their reasons, on the Chicken Treat Chart over at BackYard Chickens. You can try out all sorts of foods for your chickens and find what they like best. It’s a great use for table scraps that may have otherwise just been thrown in the trash. Just make sure to stay away from the foods on the “no-no” list and never count on your chickens knowing what’s best for them. They will eat almost anything. My chickens have come to look forward to their treats. When they see me coming with a bag of food they run over to their blue bowl to wait for me to fill it. Sometimes with a little bit too much gusto. Hank (and Scout) got into the chicken coop (again)…. I thought the same thing before we got chickens and I started reading all about them! They are just like little kids if they won’t eat their vegetables! I love the chicken that is looking up at you in the picture of them eating their bread! Her expression cracks me up! They seem to prefer the sweet fruit instead 🙂 Maybe if I had introduced veggies first? That chicken that’s looking up in the picture (Cecilia) is always watching me when I’m around. I had no idea chickens ate/liked fruit. It appears we share a similar taste, chickens! They go crazy over it! Lucky for them I, like you, also love fruit. I buy whole cantaloupe, honeydew and all other kinds of fruit about ever 1.5 weeks, and they get all the extra stuff we don’t eat from it (strawberry tops, center & seeds of melons, etc. ).